Japanese luxury maker offers a more revealing tease of Prototype 10. The Infiniti Prototype 10 is meant to give the classic roadster a battery-powered kick. Infiniti is doing a slow fan dance as it begins to reveal the “daring electrified speedster” it will formally unveil at the Pebble Beach Concours d’Elegance later this month. It’s the latest in a series of extreme concepts and more conventional production models that the Japanese luxury brand has brought to the annual Pebble Beach event and the new Prototype 10 is meant to highlight Infiniti’s planned shift to electrifying future products. “It is appropriate that we found inspiration in an optimistic bygone era in which cars were characterized by the simple love of driving,” says Karim Habib, Infiniti’s Executive Design Director. But while Prototype 10 may be meant to celebrate what Habib calls “some of the most evocative car designs of all time, where power was celebrated through high – powered single – seat competition cars,” it is anything but a retro-mobile. 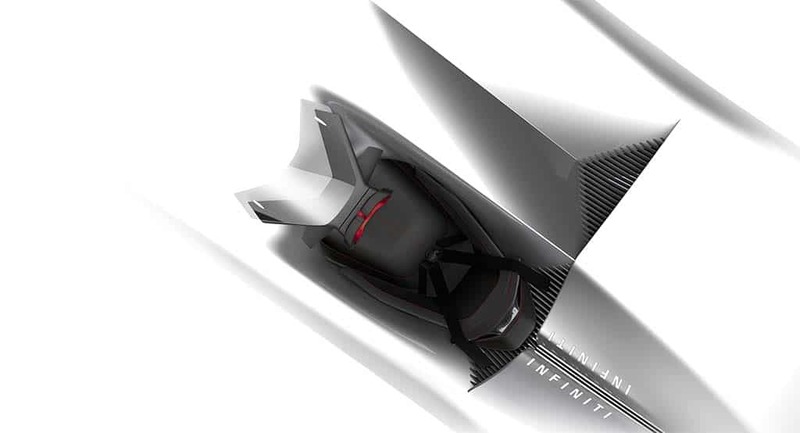 Infiniti first offered this tease of the Prototype 10 earlier in the month. “Our new concept speaks of an electrified future, something which is reflected in its form and details,” the executive explains. We’ll have to wait for specific details to dribble out between now and August 23rd, when the Infiniti Prototype 10 makes its formal debut. It’s expected to use a pure battery-electric drivetrain, though the luxury side of Nissan Motor Co. has also indicated that it is working on plug-in hybrid technology, as well. What’s clear is that Infiniti has shifted gears from years past when it was looking at battery drive technology as a way to emphasize fuel economy alone. “For us, electrification means performance,” Habib said earlier this month. Of course, Infiniti is by no means alone in that approach. Jaguar’s new I-Pace all-electric SUV can hit 60 in barely 4.5 seconds and the new Porsche Taycan is expected to be even quicker. At a Milan event in June, Fiat Chrysler Automobiles revealed that the new Alfa Romeo 8C flagship will feature a plug-in drivetrain making over 700 horsepower. Tim Kuniskis, the head of both the Alfa and Maserati brands, told TheDetroitBureau.com last month that not only will all future models off electric drive options but that they will be positioned as the pinnacle of performance, a step above twin-turbo V-8 models. 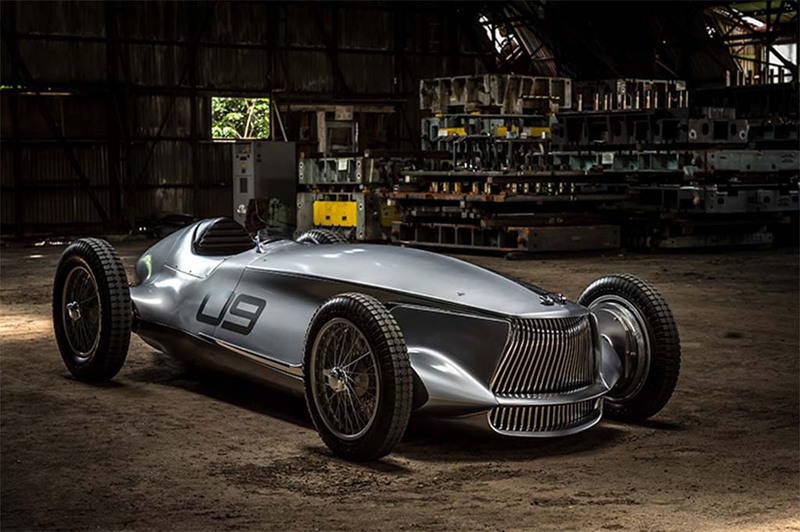 The Infiniti Prototype 9 made its debut at the 2017 Pebble Beach Concours d'Elegance. Infiniti actually was positioned to become the first luxury brand with an all-electric model, but it scrapped that plan – which would have been an upscale version of the more plebian Nissan Leaf – and temporarily put its electrification efforts on hold. Then, Nissan Motor Co. CEO Hiroto Saikawa laid out the new direction during a speech at the North American International Auto Show in Detroit last January. “Infiniti will have a specific focus on electrification,” Saikawa explained,, adding that, “We are trying to position Infiniti as the premier electrified brand” as part of the five-year Nissan business plan that will extend through 2022. Along with pure battery-electric vehicles, Infiniti will add what Saikawa called e-Power models. These also are referred to as extended-range electric vehicles, and include such current offerings as the Chevrolet Volt and BMW i3 REx. While similar to plug-in hybrids, they use onboard gasoline engines solely as generators to power their electric motors. The shift to electrification came as something of a surprise, however, as the brand had just announced plans to launch a breakthrough gasoline engine, the VC-T, capable of automatically modifying its compression ratio to balance performance and fuel economy. The VC-T may yet find application in future Infiniti hybrid models, however, company insiders hint. The debut of the Prototype 10 comes a year after Infiniti brought the Prototype 9 to Pebble Beach. That show car reimagined a classic race car design using an all-electric powertrain. Expect to see a number of automakers use the Pebble Beach Concours as backdrop to debut new concepts and production models, many of them electrified. That includes Audi which will reveal the battery-powered PB 18 e-tron, a nod to the R 18 race car that has helped it become a dominant force on the endurance car circuit. This entry was posted on Thursday, August 16th, 2018 at and is filed under Automakers, Automobiles, Concept Cars, EVs, Electrified Vehicles, Infiniti, Luxury Vehicles, Pebble Beach Concours, Sales, Technology, Trends. You can follow any responses to this entry through the RSS 2.0 feed. Both comments and pings are currently closed.